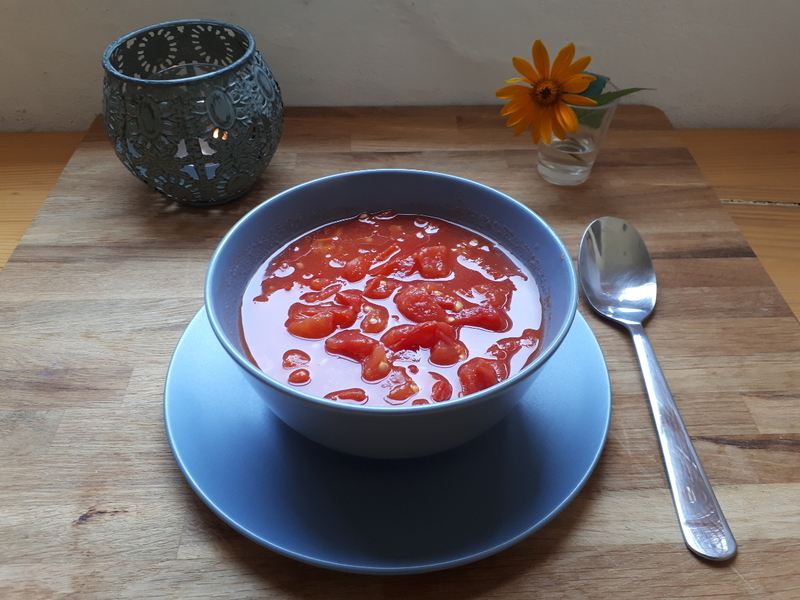 This recipe is always a favourite at the end of a fast: warming, comforting and nutritionally perfect, packed with a wide variety of vitamins, minerals and antioxidants (such as lycopene, beta-carotene, potassium, Vitamins C and K). It’s so well loved that I found myself with a revolt on my hands at the end of this year’s 7-day fasting retreat, when I couldn’t find enough ripe tomatoes at the market to make this dish! Ripe tomatoes are key in bringing out maximum flavour and texture, so I suggest buying the tomatoes a few days in advance and then either keeping them in the fridge (if already ripe) or setting them in the sun until they reach an ideal condition. I’d also suggest preparing more than one serving at a time, as the soup can be warmed up again later in the day. Dice the ripened tomatoes, slice the garlic and place both in a saucepan. Gently bring to a boil and then immediately take off the heat to cool. If the tomatoes are sufficiently ripe, this is all the heating they’ll need to release their juices and melt together into a perfect soupy texture. If you see that this isn’t happening, you can try keeping the lid on the saucepan as it cools. Alternatively, you can bring the soup back to the boil for a moment. (However, this kind of additional heat does damage the vitamins.) There should be no need to use a blender here to create the perfect texture! After the saucepan has cooled down enough, serve warm. You can add a dash of olive oil and/or balsamic vinegar to the bowl, but it’s worth trying pure and simple first, without the ‘excitement’ of any other added tastes. It’s no surprise that in Hungarian the word for ‘tomato’ (paradicsom) is the same as that for ‘paradise’. At the end of a fast, this soup truly is divine! Awsome Tallis, cant wait to try that tomato soup when i break my fast !